생물메기탕! Fresh catfish soup! Only 10,000 won a portion! Delight of delights; a new delicacy to try... Turns out the 10,000 won deal is only at lunch time and for dinner they add on an extra 5,ooo for good measure, but I wasn't deterred. I was shown to my own private room and was treated royally. 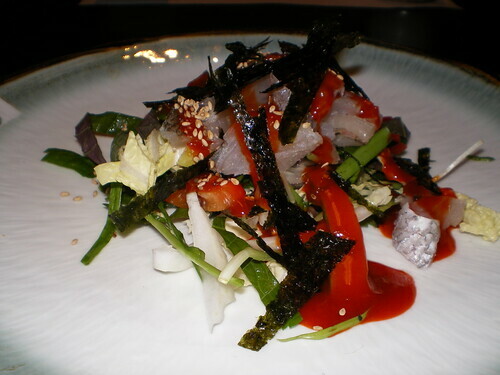 The fish was fresh and succulent, not too chewy and well complimented by the assorted leaves, seaweed and slices of pepper all covered in the traditional sweet chili sauce. Next to come - the main course accompanied by a fabulous array of eleven 반찬 (side dishes). 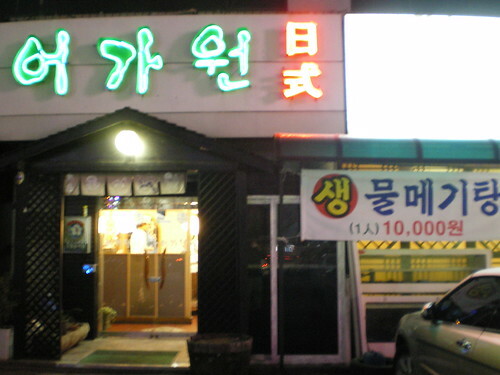 The catfish soup was bubbling hot and topped with a seasonal treat, a large handful of 냉이 (shepherd's purse). 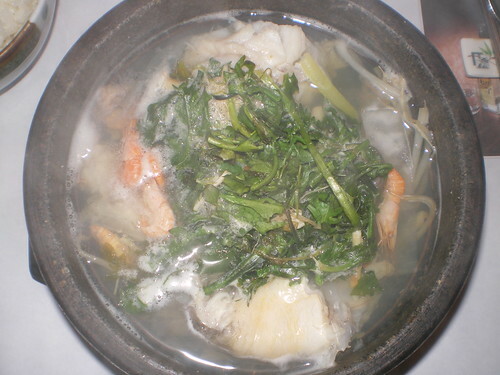 The broth was simple, but very tasty and packed full with bean sprouts, tiny prawns and large chunks of catfish. A delicious meal, with only one small drawback; like most fish soups that I've had in Korea, there was a lot of skin, a lot of bone and not too much flesh. Still it was definitely worth trying and the raw fish salad was a very welcome bonus to the meal. 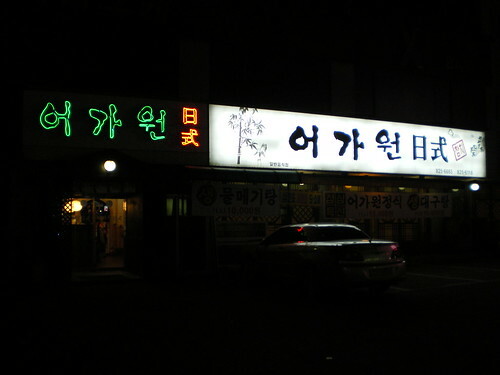 어가원 (the restaurant) is worth a look if you are in the area and in the mood for something a little different. They specialize in tuna, but the catfish is a far more interesting option. Contact them on 042-825-6665 for more information or directions.